5 mm triple resonance (1H/X/Y) magic angle spinning (MAS) probe with different X/Y frequency combinations (realized with various RF inserts) including 13C, 15N, 31P, 11B, 69Ga, or 2H allows to perform high-resolution solid-state NMR experiments in the temperature range from -70 to 80 °C. 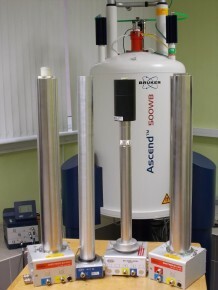 low-temperature wideline probe with four coils (10 mm for 15N, 5 mm and 10 mm for 2H - 139La, and 5 mm for 59Co - 69Ga) allows to perform static NMR experiments down to 7 K.
gradient system and diffusion probe with two coils of 5 mm diameter dedicated to 1H and 2H allow to perform pulse field gradient (PFG) NMR diffusion experiments using maximal gradient strength in z direction of 3000 G/cm. additional equipment like high-pressure lines with nitrogen gas or dry air, heat exchangers, nitrogen evaporator, efficient gas refrigerator, dewars, pumps, etc. allow to obtain a broad range of experimental temperature conditions. 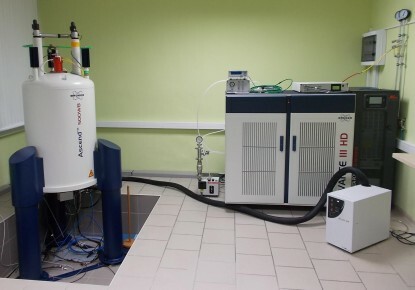 SPINMASTER FFC2000 (the fast Field Cycling NMR relaxometer) is a unique NMR instrument designed to measure the field dependence of NMR spin-lattice and spin-spin relaxation time T1 and T2 (Nuclear Magnetic Relaxation Dispersion profiles) from 10 kHz to 40 MHz (1H Larmor frequency). 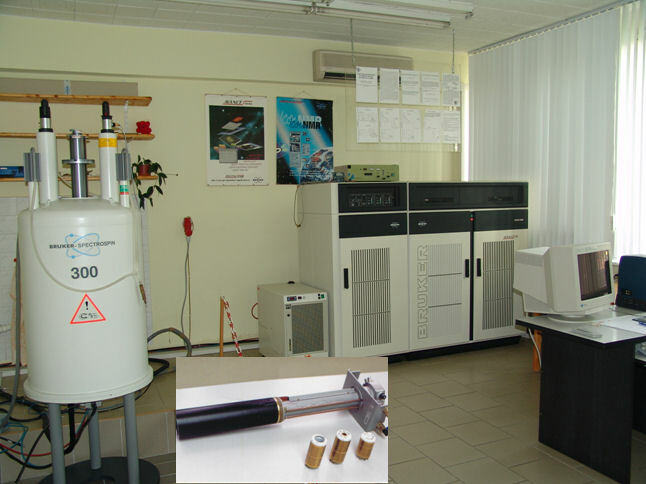 The system consist of the following units: 1 Tesla wide-bore electromagnet, double circuit magnet/power supply cooling system; 3 NMR probes working in different frequency range; variable temperature controller system for sample temperature control with 0.1 °C precision in the range of - 120 to + 140 °C; local magnetic field compensation system for low Field Relaxometry and Personal NMR Console with Software package: AcqNMR32. The compact model of SPINMASTER FFC2000 with the electromagnet. The switching time between the polarization, relaxation and detection magnetic field can be 1 ms.